A half-drowned jumping spider (male Platycryptus undatus) sits perfectly still. Notice the reflections of the forelegs and pedipalps in the eyes. It’s easy for a person to overlook the life of a tiny creature. Especially a strange, eight-legged, eight-eyed creeping and crawling creature. It’s no newsflash that people loathe and fear spiders, and it seems to be, if not a primitive response, an irrational one. Irrationality is a bit like city hall: there’s no fighting it. I have found explaining the beneficence and beauty of spiders to people who are afraid of them is often warded off behind braced faces with polite smiles. I’m not sure if it’s the simple mention of them or the audacious suggestion that they are something other than hideous, nefarious, sneaking tiny vectors of pain and death, but people seem unable to even entertain the idea. So what’s a bug lover to do? Well, dear arachnophobe, let me kill you (or more precisely your fearful notion) with kindness. And maybe a little beauty. I’d say a lot of beauty in this male Platycryptus undatus jumping spider, but I don’t want to push it. I found this impressive specimen the same day, maybe an hour later actually, as another orange-masked jumper I posted a few weeks back. This one however was not an active, curious guy, but a soaking, inert mess. I was washing up my hands in the bathroom sink when a stray glance caught a very bug-like dark spot on the bottom of the bathtub. No doubt this large jumping spider had been caught in torrents of a human’s shower. Scooping it up was easy; it offered no resistance, no movement. It was quite a sad sight, and I wasn’t sure if it was alive. I’m not a big fan of shooting dead arthropods (though some photographers get fantastic results), mainly because that void, dead look they have is often depressing and the opposite of inspiring. Some critters look less dead than others, however, and this one if it was dead was only just recently and by the looks of it, had given up the ghost in the prime of its life. Getting super close-ups of living jumping spiders can be quite a challenge so I decided, I had to shoot it. And shoot it I did, for quite a while, as it rested on a piece of rough, brown paper. It still wasn’t moving at all, but I was getting that kind of jumper portrait that one always hopes for. Naturally, because I’m me, I didn’t like what I was getting so I kept firing off shot after shot, until eventually I wore myself out a bit with my own displeasure. It was right about then, after being bombarded for at least a half-hour of flash strobe bursts that my damp little friend began to move. It was not a sudden or frantic “Run for your lives!” dash, but a measured movement, kind of like waking up on the weekend. This humble reanimation was, at least for me, the waking joy of life, that curious, earthly phenomenon. I immediately felt better about my photographs, knowing I got a “live one” but also the one I helped to live. I ceased all ideas of shooting it any more and adding to its traumas of the day and placed it in one of the windows where these spiders seemed to be at home. It hung out a bit on the screen, and after I had left it and returned a while later to check on it, the spider was gone, no doubt to new adventures and dangers. A few notes on this photograph: this shot is uncropped. As in my previous post of the yellow crab spider, I used a duplicate layer and mask to selectively adjust the levels. As you can from the reflections in the eyes, the flash was coming from the left which meant heavier shadows on the right. There are limits to this method, and if I wanted to make more stark adjustments, it might have been prohibitively time-consuming, but in the end I was able to brighten up the right side enough to give it an even but still natural-looking appearance. One thing I did discover in working on this shot was a better way to blend the edges. Selectively adjusting contrast and brightness is going to “leave a mark,” and it’s usually an outline at the border of the edited and non-edited areas. For the crab spider, I didn’t need to do as much blending because the photograph was basically split in half with a dark side and light side. I took care of minor discrepancies by using the Blend tool on the layer mask. For this jumping spider portrait, the shadows were mostly on the right side of the spider’s face, but not on the background. Essentially I ended up with a lot more border lines, and ones of irregular curves and shapes at that. At first I tried making selections and using the Blend tool to smooth out the colors. This approach sort of worked, but I kept getting crossover areas that needed to be redone. I tried using the Paintbrush tool at varying opacity levels to sort of “manually” smooth it out, which just made a bigger mess out of it. Finally, I turned to the Heal tool, which is one of your better friends in GIMP, and for some reason the idea struck me for the first time (and it seems embarrassingly obvious now) to use it on the layer mask. I don’t ever remember using it there before, but it worked like a charm in evening out the transition between the edited and non-edited areas. How’s that for some waking photo-editing joy of life? 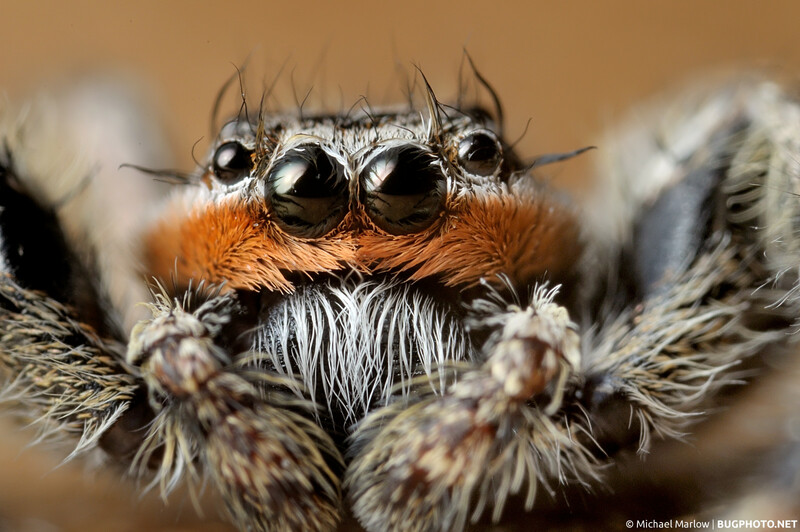 Posted in Jumping SpidersTagged arachnophobia, big eyes, bug portrait, facial hair, gimp, good Samaritan, hairy, jumper, jumping spider, Macro Photography, orange, Platycryptus undatus, post-processing, reflectionBookmark the permalink.